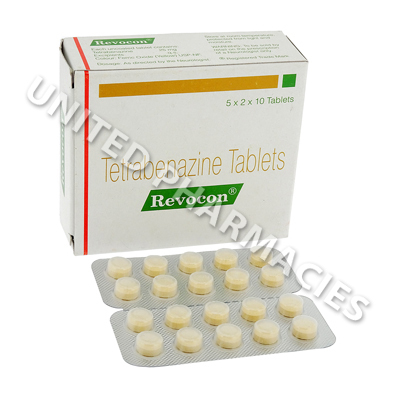 Revocon (Tetrabenazine) is a monoamine depletor medication prescribed to treat Huntington`s disease. 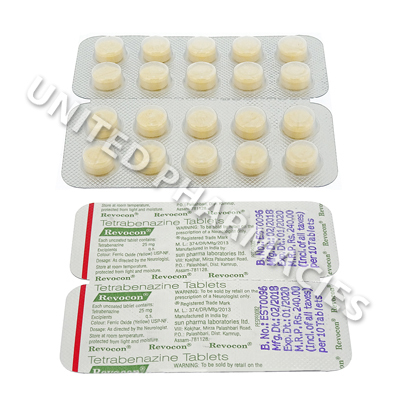 Revocon (Tetrabenazine) is a monoamine depletor medication prescribed to treat Huntington`s disease. It will not cure the illness but will help to manage the severity of its symptoms. It may also be prescribed to chorea (uncontrollable movements) sufferers for the same reasons. It works be reducing the uptake of certain substances found in the brain such as dopamine, serotonin, and norepinephrine, which directly affect muscular and nerve functions. This allows the patient greater control over movement and a chance at partaking in previously difficult daily activities. Always follow the instructions given to you by your physician. Dosage will vary depending on your condition and past medical history. Typically Revocon (Tetrabenazine) is taken once a day in the morning, either with or without food. It is recommended you dose at the same time(s) each day. While taking this medication your progress should be closely monitored by your physician, who may choose to adjust your dosage in an attempt to find the optimum dose for you and your condition. If you do not notice any improvement after using this medication for some time, consult your physician. The most common side effects include drowsiness, dizziness, nausea, vomiting, fatigue, and insomnia. Consult your physician promptly if any of the above side effects persist, worsen, become bothersome, or become worrying. Inform your physician immediately if you experience any of the following more serious side effects. If you experience any of the following adverse effects seek immediate emergency medical attention. Avoid driving or operating heavy machinery until you are sure how your body reacts to the medication. Some patients become dizzy or weak after dosing. Limit your alcohol consumption whilst using this medication, as alcohol can increase the severity of side effects. Prior to taking Revocon (Tetrabenazine) always disclose any of the following to your physician.